One of the greatest aspects of #SocialMedia is the diversity of thought leadership behind it. As a new and quickly developing field, it transcends many traditional social and cultural boundaries. We at SMWi Toronto are proud to have such a strong female contingency at this year’s event. 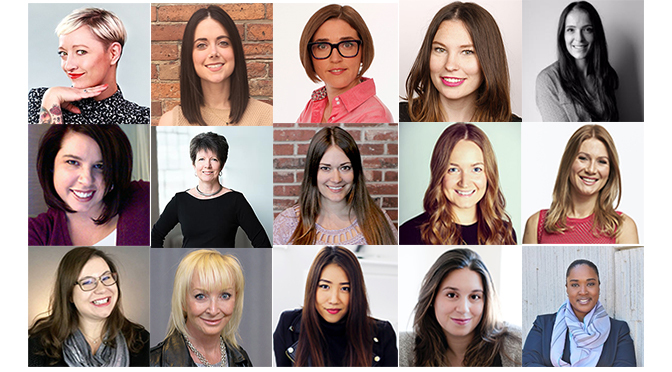 Read on to hear more about 15 incredible female speakers at Social Media Week who have great stories to tell. As President and Head of Research at Trend Hunter, Shelby was awarded the Top 30 Under 30 and WXN’s Top 100 Most Powerful Women in Canada, while being featured on BNN, TIME and in the Financial Post. Staying on top of the ever-changing world of trends, she oversees custom trend research for over 100 brands such as Nestle, Samsung and NBC Universal. Both All Access and Single Day Pass holders can tune into her session Creating a Cultural Connection at the TIFF Bell Lightbox (Cinema 1) on the first day of SMWi Toronto for 9:15 AM. As the SVP of Marketing for Sysomos – a global leader in social intelligence – Amber is a seasoned communication strategist specializing in the new era of digital and social business. Involved in a variety of industries her professional expertise spans nonprofit management, corporate communications, marketing, professional services, and social business strategy. Both All Access and Single Day Pass holders will have the privilege of listening to her speak about The Future of Strategic Social Media at the TIFF Bell Lightbox (Cinema 1) on June 7th @ 10:00 AM. Michelina is the North America Social Media Manager at lululemon. Enjoying pizza and a glass of red wine with girlfriends, reading books for her book club, or participating in a good spin class, Michelina is truly the heartbeat of the lululemon brand. All Access Pass holders won’t want to miss her talk on Creating the Conditions for Magic at Brainstation on June 8th @ 11:00 AM. Deborah Weinstein, President of Toronto PR firm Strategic Objectives, is a recipient of both the Queen’s Golden and Diamond Jubilee Medals for Outstanding Service to Canada and it’s Communications Industry and was named to UK research firm Onalytica’s List of the World’s Top 100 PR Influencers. An active volunteer, she has served on the PRSA Counselors Academy Board for the last three years. Strategic Objectives has captured IABC/Toronto’s PR Agency of the Year in 2015, 2014, 2012, 2011 and 2009, is the only Canadian firm to receive the United Nations Grand Award for Outstanding Achievement in Public Relations PR, and has been named to the PR News Top 10 CSR Agency A-List. Join Deborah and her colleague Adam Sanders on June 9th at 1:30 PM in the Brightlane ExChnage room as they examine how to drive social success by leveraging real-life events and news with their talk on “From IRL to Social Sensation – The Great #PringlesDIPate”. Mama Bee is the “Super Mom” of the EhBeeFamily! With close to 10 million Facebook fans, 3 million followers on Vine, and 1.5 million subscribers on YouTube, the Eh Bee Family of four have risen to fame with their short-form comedy videos poking fun at daily family life. They believe that laughter and family pair well together, to create the perfect entertainment for viewers of all ages. Join MamaBee, Jamie Michaels and Veronica Watson MacDonell on June 7th @ 10:25 AM in the TIFF Bell Lightbox for a panel on what one tweet can mean to a person’s view of themselves and their self confidence – From Insights to Action: Changing the Conversation One Tweet at a Time. Veronica began her career at IMG Worldwide, working on licensing and events for sport and entertainment properties with an educational background from Dalhousie University where she graduated with a Bachelor of Science and Bachelor of Business Management. As an Associate Brand Strategist at Twitter Canada, she partners with top Canadian brands to build creative programs that make an impact and connect brands to their consumers. In this role, she has launched campaigns with top Canadian and global brands, providing guidance from initial concept all the way through to program execution. Prior to joining Twitter, Veronica was a brand strategist at TwentyTen Corp managing social strategy as well as building integrated sponsorships for a variety of Canadian sport brands. Veronica will be on a panel along with MamBee and Jamie Michaels at the TIFF Bell Lightbox on June 7th starting @ 10:25 AM, where self-confidence and Twitter will be discussed – From Insights to Action: Changing the Conversation One Tweet at a Time. Head of the Ontario region at CBC and known as one of the leading digital news executives in Canada, Marissa Nelson will discuss how CBC Toronto is adapting to succeed in the digital age. In her role, Marissa is responsible for setting CBC Ontario’s strategic direction for TV, radio and digital. Her region encompasses eight stations, including the nation’s capital, Ottawa and the largest city, Toronto. Marissa will be speaking on June 9th at Brainstation @ 12:30 PM revealing The Future of Media in a Multi-Platform World. As our content landscape is continuously changing, Marissa will touch upon how CBC has evolved from traditional broadcast channels like television and radio into a multi-platform brand. After graduating from the Schulich School of Business at York University with a focus on brand management, Jane worked as a brand manager at General Mills on the Yoplait acquisition team, where she led product innovation. She later was involved with the Exact Media team (at the time a 5 person start up) based in NYC and worked on growing the business in the US. After gaining experience at a start-up she quit to start her own business, silly b intimates – a bold, light-hearted and cheeky lingerie brand that specializes in creating the most reliable underwear for the modern woman. She is now the entrepreneur in residence, building the Shopify store. Join Jane, Jaya Kahlon, Yanal Dhailieh and Brittany Hopkins as they discuss how to build a brand with shopify fueled by entrepreneurial drive. Shopify Merchant Stories: The Entrepreneurial Hustle will be held at Brightlane’s ExChange room on Jue 8th at 9:00 AM. Kendra Nicholson is an eight-year marketing pro and Community Manager at Steam Whistle Brewing. SMWi Toronto is excited to feature her best-of- breed content strategy and wisdom of Steam Whistle’s social channels. In contrast to a world of pre-designed memes and automated responses, Kendra has helped to build the 2nd most engaging Canadian Beer Brand on Twitter (and the only craft brewery to rank) by gaining reputation as the beer that ‘tweets back’. Just think of her as the Fairy-Beer- Mother, equipped with a bottle opener rather than a wand. Kendra recently sailed through all three levels of Prud’homme Beer Certification (beer sommelier) in just over a year, which is a lot of hops to smell and a lot of beer to swill. Prior to slinging beer suds over social, Kendra helped manage the online presence of a collection of boutique hotels and resorts as well as operating as a consultant for various small businesses and startups in Toronto. In her spare time, Kendra enjoys hunting for rare vinyl, collecting stamps on her passport while managing the social media presence of several well-known Trinity Bellwoods dogs. Kendra wants to remind you, that whether building your corporate brand or your personal one, sometimes the most valuable conversations are the ones that nobody sees. Kendra will join us from 4:30-5:00 on Wednesday, June 8th as she explains how to Build Brand Loyalty One Keystroke At A Time. Casie brings a number of accolades to SMW as a writer, blogger, and director. In 2016 she was recognized by the Academy of Canadian Cinema & Television as a pioneer in the world of social and digital media. She’s worked with many of the worlds top brands including MTV, Virgin, Puma, and Pepsi. Her website, casiestewart.com features a collection of blogs which detail her travels around the world. She started her blog in 2005 as a way to keep more memories and it’s grown to be one of the top lifestyle blogs in Canada. She also loves long weekends at the cottage, surfing, and good wifi. Casie’s session is titled, “Authenticity & Social Influencers – When it works and When it Doesn’t“. She takes the stage from 11:00-11:50am on Day 2 of SMWi Toronto at BrightLane. Erica Edwards works as Marketing Manager at Uber Canada, where she is responsible for brand management, content marketing and social media. We’re excited to have her at SMW in Toronto because of her involvement with a highly disruptive company that has had a great deal of success. Erica has a global yet hyper-local focus, and she’s helping build Uber’s brand and grow its presence both in Toronto and Canada. Always up for a new challenge, Erica has gained a range of experience across the marketing mix to lead integrated campaigns and drive real results. Her talk, “How Cultural Values Shape Campaigns” happens on day 2 of SMWiTO at BrainStation from 12:30 to 1:20pm. Sophia Jurksztowicz joined the NHL on Sportsnet broadcast team in September 2014. A regular fixture on Hockey Night in Canada and Hockey Central, Jurksztowicz reports on up-to-the-minute social media trends and provides in-studio NHL news updates on marquee game nights. Her story is a great one because she’s highly successful in an environment that is traditionally male. Jurksztowicz began her career interning at Talk Radio AM640, followed by the theScore in 2008. Following her graduation from Ryerson University with a diploma in Radio and Television Arts in 2010, Jurksztowicz joined theScore full-time working behind-the-scenes before stepping in front of the camera as a reporter and host. Transitioning to Sportsnet in 2013, Jurksztowicz continued her work with live sports updates and regularly contributed to City Toronto’s sport coverage before formally joining the NHL on Sportsnet broadcast team in 2014. Sophia will moderate a sports panel that discusses “How Sports Brands Nurture Fan-Based Communities” that takes place from 3:30-4:20 at BrainStation on Wednesday, June 8th. We’re pleased to welcome Donna Papacosta and her Podcasting expertise to the SMWi Toronto stage! She is the co-author of The Business of Podcasting, the author of The Podcast Scripting Book, and a professional podcaster since 2005. A former systems analyst and magazine journalist, Donna has been producing online content for more than two decades. Today she consults with clients throughout North America and teaches digital strategy and social media at the University of Toronto School of Continuing Studies. She frequently speaks at conferences and leads her own social media and content marketing workshops. She will explore “The Power of Podcasting” as a business tool. Her talk takes place at BrightLane from 2:30-3:20pm on Wednesday. Award-winning columnist and speaker Jill Andrew, PhD(c.) aka “Ji! !” is passionate about documenting and celebrating people’s body stories. Jill is co-founder of the Body Confidence Canada Awards (BCCAs), FatinTheCity a fatshion lifestyle blog, associate producer of the documentary Shadeism: Digging Deeper, co-editor of the upcoming anthology “In Our Skin: Our Bodies Our Stories”(Demeter Press, Toronto ON), and a board advisor to NAAFA (National Association to Advance Fat Acceptance) among other body positivity projects and orgs. Jill also created Curvy Catwalk Fashion Fundraiser – a first in Toronto at the time (2006) and BITE ME! Toronto Int’l Body Image Film & Arts Festival which was inspired by her Masters from UofT in Women & Gender Studies. Jill frequently appears online, on-air and in print discussing body image as it intersects with size discrimination, fat activism, race & representation, social media, fashion/clothing politics, and women and girls’ leadership and empowerment. Jill pens the column “THIS Abject Body” (THIS Magazine) and also has done a TEDtalk @YorkU on Fat Shaming & the Thin Epidemic. She recently spearheaded a CHANGE.ORG campaign to help END SIZE DISCRIMINATION. For more on Jill, including her awards and community volunteerism. Jill will be a part of Self-esteem in the Age of Selfies: A Panel on Confidence and Body Positivity in the Technology World at Brightlane on June 9th, 2:30 PM.